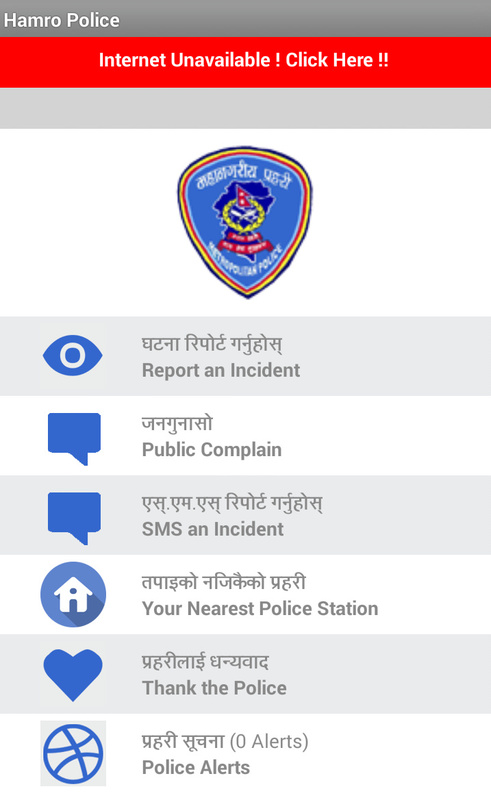 This week Kathmandu Metropolitan Police Office has released an android app, named Hamro Police, which aim to secure our community with the help from an each individual by reporting an incident, public complain, SMS an incident and getting police alerts. This app was possible through joint initiative of Metro Police Kathmandu (@npmetro), Local Interventions Group (@LIGintl) and Islington College, with technology support from Third Pole Connects Pvt. Ltd.
No doubt, it’s an effective technological tool to get connected with our Police department. Now, it feels like our government is knowing the value of technology. Technology is that crucial component which brings us together in one mission. BlogorTech, welcomes this initiative. So, today, I would like to get involved in this app in more detail. Without much further ado. Let’s get started. Although, each features of Hamro Police app run flawlessly but in the context UI, it is just fine. It would have been more user friendly if you have added GridView instead of ListView. In context of UX, it is not available in offline. Even, to report an incident via SMS, user need to have internet connection. I have inserted a screenshot so that you can know were this issue is coming from and hope it will be fixed soon. Report an incident: You can report an incident by filling a form where you have to write about your incident title, description, date, location, upload an image. Public Complain: Any complain which you are experiencing at government offices can be report directly in this section to Police by filling the form which is just like the form of report an incident. SMS an incident: There is an issue in this feature, it is because to send an SMS you must have an internet connection. Strange ! YES ? Hope in the next update, user can easily send an SMS without enabling an internet connection. Your Nearest Police Station: This feature allow to see your nearest police station information by first enabling GPS. In this section, it is taking a quite long time get the list of nearest police station. Thank the police: If you are satisfy with the responsibility that any police officers has shown. Then, why don’t you share with overall Police department? Let’s make smile on their face. Police alerts: You will be the first person to know the latest alerts all the way from Police department. This app will be really useful and effective to any individual. For that, we need to get involved directly and make sure to give complete information so that your incident will be solved. This app will be obsolete, if we are not using it. In another dimension, Police Department, specially who are looking in tech part, should be highly responsive. It means, user should get a prompt response to their complaint on specific incident. In short, it’s a two way communication. I want to make this conversation more interactive. Let’s give our individual feedback on this app. Our feedback can make this app more closer to the goal. For that, comment section is just right below. So, do share this app with your friends and family. Let’s give our individual effort to this app. JAY NEPAL !